I’m often asked about the best way to achieve a good red colour in icing. Depending on the type of icing being used there are a couple of different ways to do this. One thing to note about our Naturally Colourful Red Food Colouring is that you achieve a truer red colour in an acidic medium. For buttercream icing this can be done with lemon juice and in fondant citric acid can be added. In an icing that isn’t acidic you might just need to use more colouring. 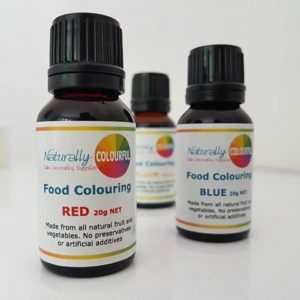 When used in small amounts our Red Food Colouring can make a beautiful pink colour and if you keep adding more the colour will deepen and become red. The two cakes below are both covered in buttercream. Fondant can be a little trickier to colour red, it will often end up looking more pinky than red. My quick fix for this is to paint on the food colouring using a small amount of alcohol (like vodka) mixed with the colouring to make it easier for paining on (it will just evaporate off). The above two cake toppers are made with fondant. The Spiderman mask has food colouring painted on to it and the wee plane is just coloured fondant. As you can see from all of these examples, it is fairly easy to achieve a good red colour in icing. Happy baking! !